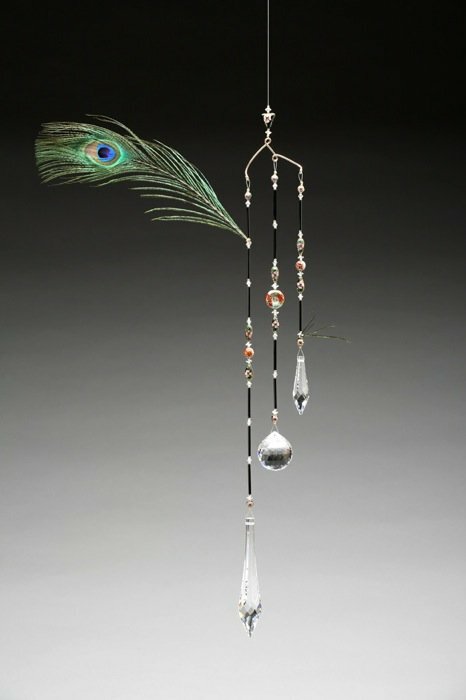 Handmade cloisonne (China), Swarovski crystal chandelier pieces and beads, smooth black Czech glass bugles,12K gold-filled cross-bar and beads, peacock feathers. 9″ X 18″ class="style17" style="text-align: left;"> "After owning and running a gallery for 17 years in metropolitan Columbus, Ohio, I moved to rural Livermore, Colorado in 1997 in search of a simpler, less frantic way of life. Although I’ve designed and exhibited beaded jewelry for 20 years, it was time to move on to something more whimsical. 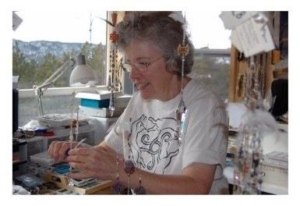 class="style17" style="text-align: left;">I developed beaded leaded glass crystal mobiles actually in 1985 and sold them in my gallery along with my beaded jewelry. Since moving to Colorado I have dumped the retail gallery concept for the gypsy life of a show artist. Travelling is one of my favorite activities as it introduces me to new colors and textures of landscape and wildlife. I find the work of other artists I meet, inspiring! They are my “Art School”. There is always a new idea or a new take on an old one. class="style17" style="text-align: left;">The evolution of the designs of the mobiles is toward a clean, uncluttered look which can be enjoyed up close or at a distance under any sort of lighting. Sometimes my inspiration is a new crystal or a new color combination I find in nature or the texture of a painting seen at a show.